In many countries, prison food is insufficient in quantity and quality. Budgets are low (less than 0.5 USD per prisoner per day according to data recently gathered by PRI) and there have been cases where prisoners have died from starvation. In higher-income countries, food is more available but still may not be ‘of nutritional value adequate for health and strength, of wholesome quality and well prepared and served’, as prescribed by the newly revised Standard Minimum Rules for the Treatment of Prisoners. 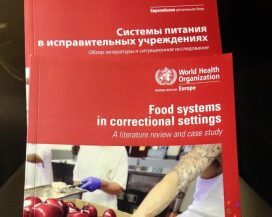 The World Health Organization Regional Office for Europe recently published a new report, Food Systems in Correctional Settings, which examines the critical role of food in the physical and mental health of incarcerated people and the construction of their identities and relationships. Amy Smoyer, from Southern Connecticut State University (USA), is a co-author of the report. She introduces the report here, highlighting in particular the psycho-social importance of food.